(Newser) – ESPN has a deep and fascinating look at what it calls "the marketing heist of the century": sneaker behemoth Nike losing out on megastar Steph Curry to comparatively tiny Under Armour. Curry is arguably the biggest name in the NBA right now, "a cult of personality so powerful, thousands flock" just to see him shoot in warmups. But in 2013, his deal with Nike was up and he was looking for a new one. Then Nike hit him with a pitch meeting that "evoked something hastily thrown together by a hungover college student," writes Ethan Sherwood Strauss. One Nike official mispronounced Curry's name as "Stephon"—like Urkel's alter ego—and didn't correct it. One of the presentation's slides still had Kevin Durant's name on it. 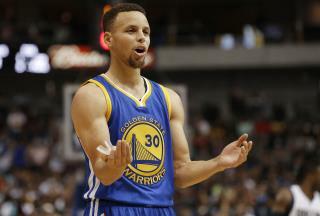 Curry's father says it seemed like Nike was relegating Curry to a "second tier" of athletes. Now those sweatshop children will have to work even harder. Nike the 'sneaker behemoth.' The editor must be 90. 2013 is when the deal went bust and only now it's a story?